Hello everyone! I don't know about you but we are experiencing yet another polar vortex. I'm thinking the winter this year is going to be a doozie. At least for some of us here in the midwest. While I don't particularly enjoy being cold, this little penguin I'm using for my project today doesn't seem to mind the cold one bit! Isn't he just the cutest??? I started by picking the plaid piece of paper from the Doodlebug Polar Pals paper pad. I let that be my guide for choosing all of my colors. I really do love this color scheme! I colored him in with Copic markers and added some sparkle with my wink of stella marker. I wasn't sure what I wanted to do with the background so I picked some blues that coordinated and just started coloring it in. I love the subtle graduated color. I also put a touch of very pale blue to make the snow blend it nicely. 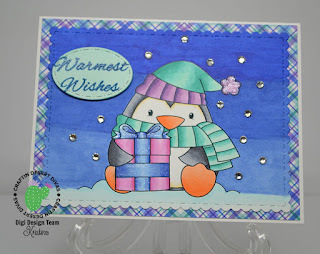 Some of my blue background bled into the snowflakes so I just brought out some bling dots! They were just the perfect size! I cut the penguin layer out using the largest die from the Fancy Frames die set. The little oval is popped up with foam tape and it was cut out using a die from the Pocket Pieces Hello dies set. I decided white looked too stark and used the same pale blue as the snow. The warmest wishes sentiment comes from the Chilly stamp set. I sure hope you enjoyed my project for today!